Tonight I finally saw The Great Gasby movie. My friend and I were quite possibly the last two people in America to see it, but we made it just before it went out of the theaters. I first read The Great Gatsby during my sophomore year of high school, and, in fact, still have my old copy. Note how I used to underline EVERYTHING. I personally loved this movie, although I know that some critics would disagree. Part of it was that magical Baz Luhrmann quality of zooming in and out and generally making every screen shot unique. Yet my favorite part of the movie was how they used so much of the book. Most of it was narrated directly from the novel. Hearing those words that I hadn't read since high school was an odd feeling. I realized that 16 years had passed (gulp) since I had read those words, which feels like a lifetime. These words in particular hit me when hearing them during the movie, and then re-reading them once I got home: "His dream must have seemed so close that he could hardly fail to grasp it," (Fitzgerald 189). Gatsby never did attain his dream of being with Daisy, and the book ends on a fairly pessimistic note. Yet in that moment, the fact that Gatsby still remains so hopeful struck a chord that I really needed today. 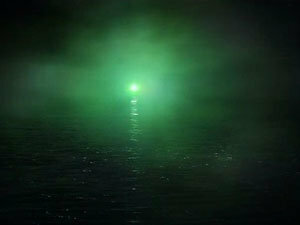 Maybe that green light just out of sight in the distance is really closer than we really do think.